"Growing up in San Luis Potosi, Mexico, I was flooded with creativity. Since I was young I had the privilege to witness works of art and being exposed to all this beauty inspired me to study Art. I did not excel in making the actual art, but I could identify it in other people. I felt I had a keen sensibility to acknowledge artistic creativity. I actually explored being a full time artist for fifteen years by molding the souls of my four children. I left my own country to relocate in San Diego and seeing Mexico from a different perspective made me realize that those living along the border surfaced their dreams, hopes, anger, despair, fears, and their daily life and exaltations through a very creative medium. 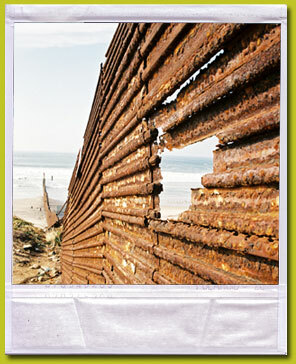 These evoked emotions became their palette and the border fence transformed into their canvas. My lens allows me to witness and acknowledge how man, time, and nature daily recreate the body and soul of this border fence. My camera captures expressions of words that paint pictures. The shapes, textures and patterns speak their own language with a diverse range of natural elements and added color. The border fence becomes alive to show the creativity of minute delicacies, ruins and fossils from its own life and the lives of those people dealing with problems and adversities who touch it."